Science is about understanding the world around you. Don't think of complicated formulas, lab coats and text books. Think of the curiosity children are both with always asking why? That's what science experiments are all about. Most science projects will use items commonly found in most households. It could be anything from an empty milk carton to some corn starch. Just be sure to take the time to read thru the science experiment before you start. Make sure you have everything on hand before you start. There are lots of eye-opening discoveries to make about the world around you. Scroll down to find links to projects investigate everything from genetics to sound. These science projects are the start of a very fun journey. Or check the Free Activity Library for kids crafts and children's activities. Kids have fun with crafts. I want to order a craft or science subscription. Air Pressure - What can you do with air? Amazing Polymers - learn about colloid polymers (putty). Genetics - learn about what makes DNA. Crystals - Kids can discover what are crystals and how to grow them. Crystals from Atoms - how they can bond together to create crystals. Flight - How airplanes fly and other experiments. Floating and Sinking - kids love watching as it goes down, and then up! Magnets, Magnetism and Lodestones - What is a Lodestone? Rocket Launcher - use air bubbles to power your own backyard rocket. Silly Slime - kids love this ooey, gooey craft for the whole family. Sound - kids can find out what makes sound and music? Static Electricity - electrifying results from these projects. Sunlight - learn about ultra-violet light. Water - learn about the surface tension of water. Fun Kids Activities - fun kids crafts and activities for children of all ages. Kids Science Projects - science experiments intended for older children (8y and up). Younger kids can learn from these science projects but need adult help and lots of supervision. Holiday Activities - theme craft projects for kids for everything from Valentine's Day to Christmas crafts. Birthday Parties ideas for children birthday parties including themes and how to suggestions. Fun Foods for Kids - fun foods that are both a children's craft idea and fun to eat! Summer Kids Crafts - what are your kids doing this summer? These summer projects will keep the kids busy having fun. Lots of outdoor activities. 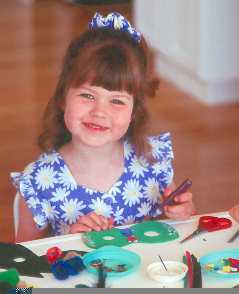 Crafts for Younger Children - craft ideas intended for younger children. You'll find everything from playdough recipes to gifts young children can make. Crafts for Older Children - craft projects for older children. Crafts from Recycled Items - special projects the create art or toys from items that would have been thrown in the garbage. Pick from the free craft and activity links above to find lots of ideas for your and your children to have with childrens craft ideas and kids science projects. Send us a note if you have any questions or suggestions for kids science projects.